Are you looking for a unique piece of jewelry that is affordable, yet not just a cheap piece that will rust or discolor within 2 months of use? (Yes, I've been there, done that!) Well, I have just the place you need to shop; a company that specializes in affordable jewelry, without sacrificing quality. Without further ado, let me introduce you to Diamond Nexus! 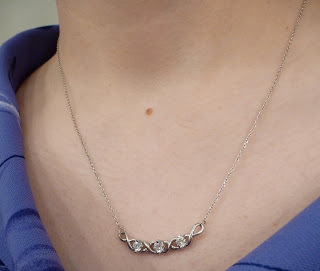 Diamond Nexus graciously allowed me to choose a piece for review, and when I clicked on the necklace page, I was immediately in love with what I saw towards the top of the page. The White Shores Necklace is absolutely the perfect necklace for me! The necklace arrived in a lovely little box, and upon opening, I was greeted by one of the most simply elegant necklaces I've ever seen. Honestly, the White Shores Necklace is just perfect! Featuring 3 round brilliant diamond cut simulants encased in a twisted silver setting. This is attached to a very dainty, 18" Lorian platinum chain. This is the finishing touch you need to add to any evening wardrobe, as it is so stunning, yet very quiet and simple at the same time. It has an understated elegance, which I absolutely love-I'm not one for the big and bold jewelry. While it could be worn with a casual outfit as well, and still look gorgeous, I personally think it goes best with an evening or dressy outfit. I've worn mine to Church, and will be accessorizing with this necklace next month when I attend a special event. 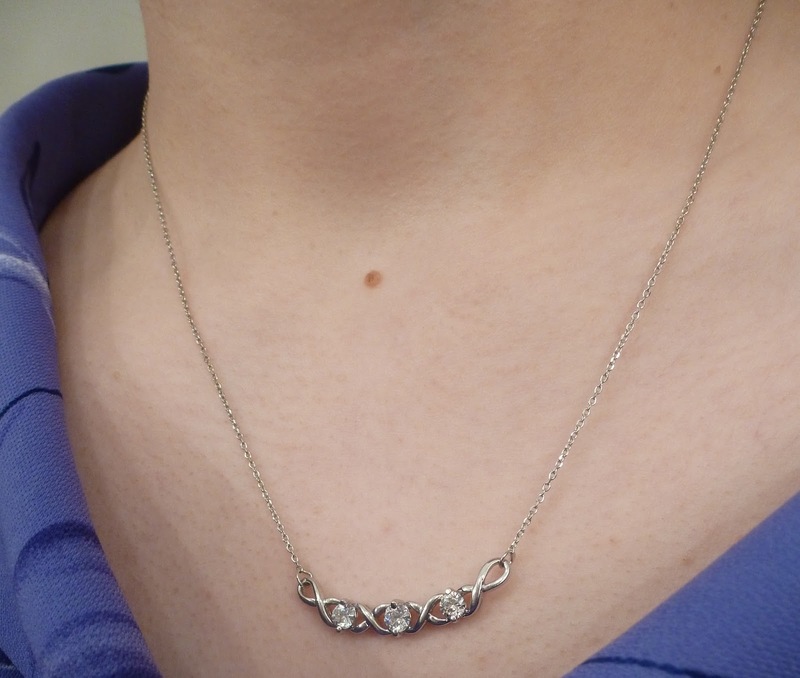 Although I have only had the necklace a couple weeks, it seems very well made, and I haven't had any issues with it. It still looks as bright and beautiful as when it arrived, and even the chain-dainty as it is-holds up quite well, and hasn't snapped or broken! I would highly recommend you check Diamond Nexus for any of your quality and affordable jewelry needs! 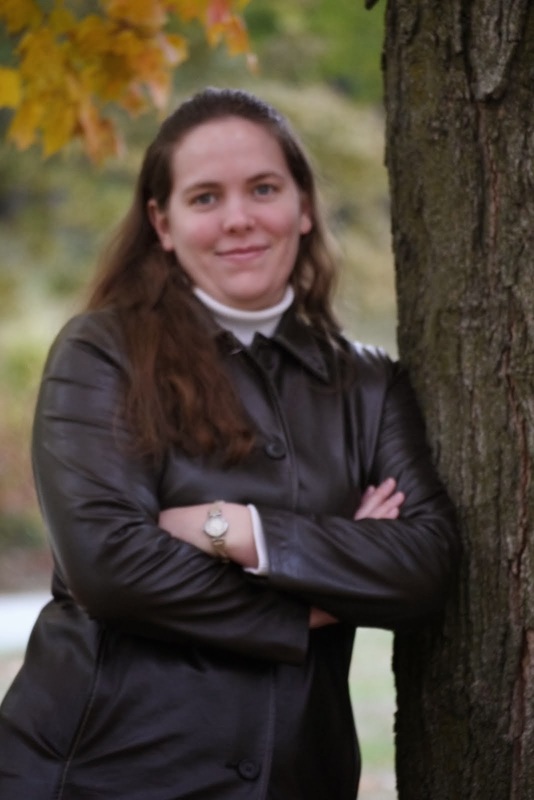 Diamond Nexus is giving a pair of Stud Earrings to one of my readers!! Giveaway ends Friday, August 30. The blog pics of 'studs wear studs' cracked me up. checked out their blog, thanks! ATG Stores is an Online Shopping Superstore!! Tae Kwon Do Tournament Results!! One-Of-A-Kind Cologne From Demeter Fragrances!! 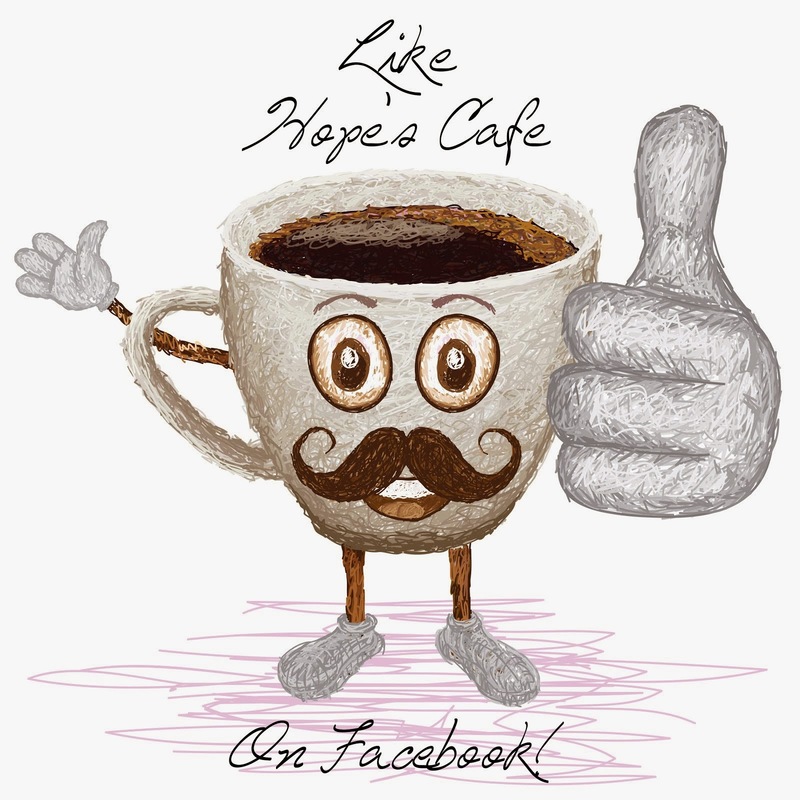 Shopping At Cafe Press Is Fun!! Fun and (Educational) Games at PowerMyLearning!! Save Money By Renting Your College Textbooks! 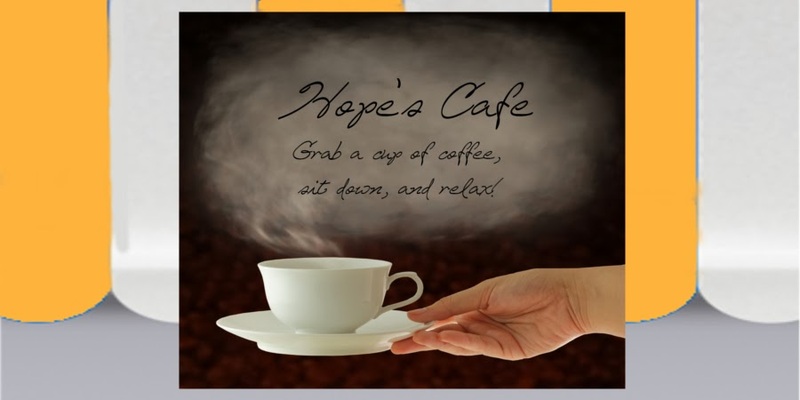 New Twitter Page for Hope's Cafe! 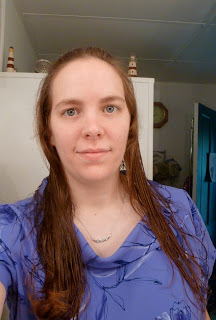 TRUHAIR Styling Tools Review and #Giveaway!